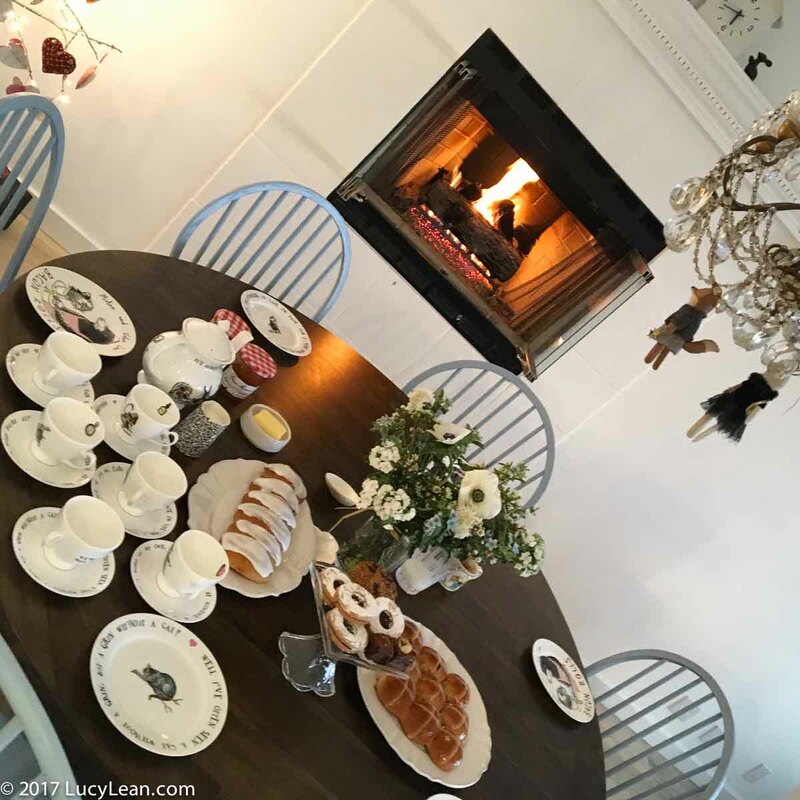 Today I wanted to share my recipe for Hot Cross Buns – adapted from a recipe given to me by my friend and great baker, Charlotte who has made them more times than a baker’s dozen. Now I know why. The recipe comes from the BBC Good Food magazine from April 2008. 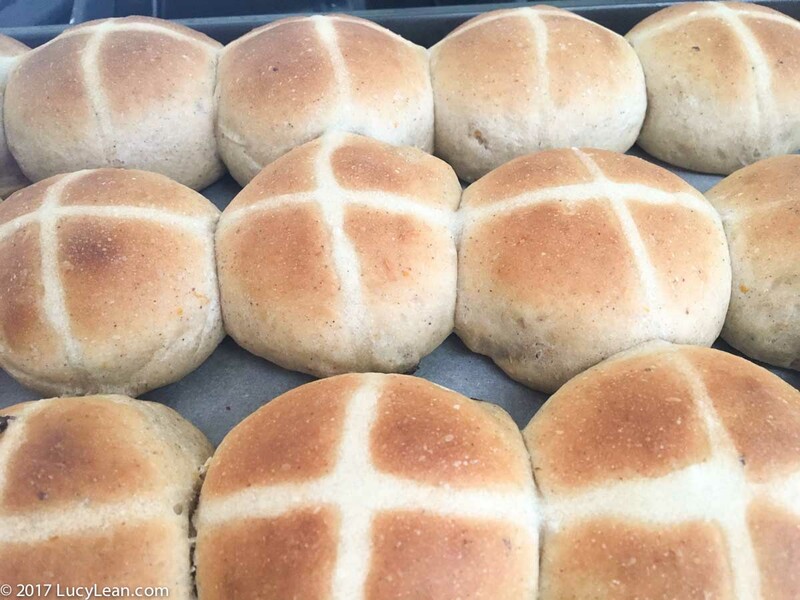 I’m a huge fan of an iced spice bun – many are purchased at Marks and Spencers when we visit England – traditional hot crossed buns are not iced/frosted – the crosses are made with a flour and water paste that’s piped on before baking. 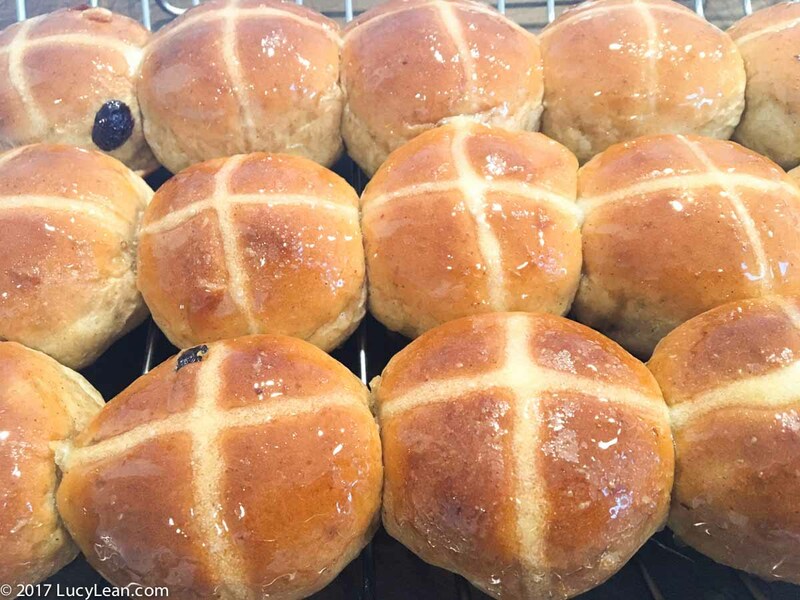 Iced buns have that distinct spicy sweetness that makes the hot cross bun so tempting. These buns are easy to make and are sure to please the whole family – apart from Rémy, who doesn’t like the raisins and insists I include them in everything I bake just to annoy him! 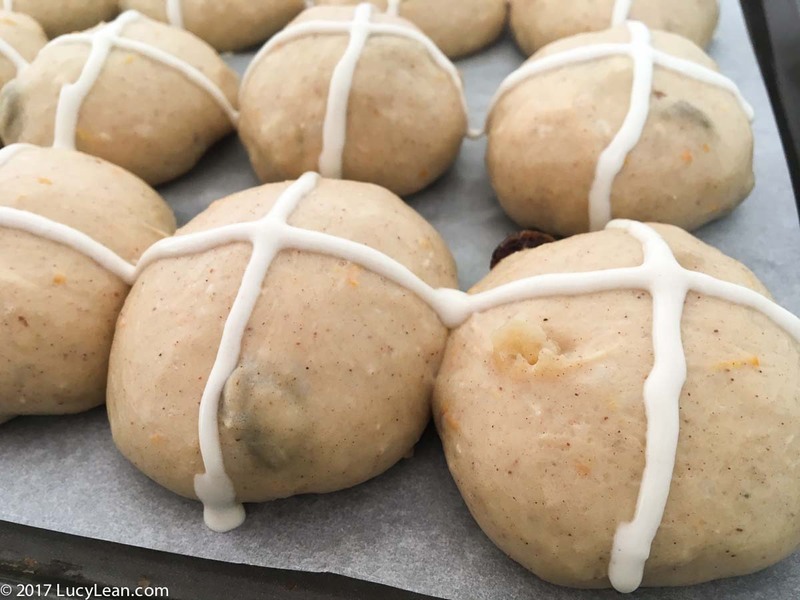 Minty wants iced crosses – “like Le Pain.” Papa is now a fan – how could he not be with the house smelling of warm sugary spice? Hot cross buns require Mixed Fruit – a mixture of vine fruit and candied mixed peel. If you can’t find a box of Mixed Fruit you can simply substitute raisins and candied peel. The other special British ingredient found in hot cross buns is mixed spice – not to be confused with allspice. 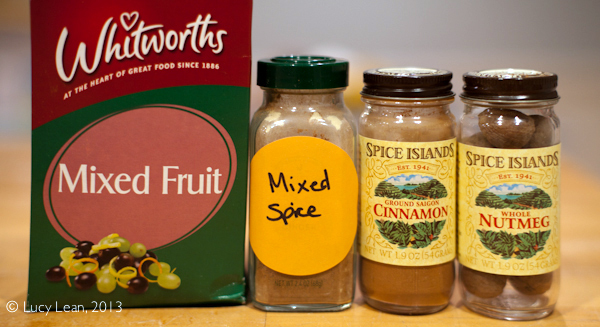 Mixed Spice is very similar to the pumpkin spice mix found in America, or you can do what I did and mix up some of your own, recipe at the end. I serve these straight from the oven for tea or on a Sunday morning. People can tuck in to the buns and add lots of salty butter. The unglazed buns freeze really well – just thaw and glaze and heat – either split and toast or bake them whole in a 350 F oven for 10 minutes. 3 tablespoons sugar diluted in hot water until dissolved to form a syrup. 1. Line a large sheet pan with parchment paper and lightly butter. Place a piece of plastic wrap over the buttered paper to transfer some of the fat. Set aside. 2. 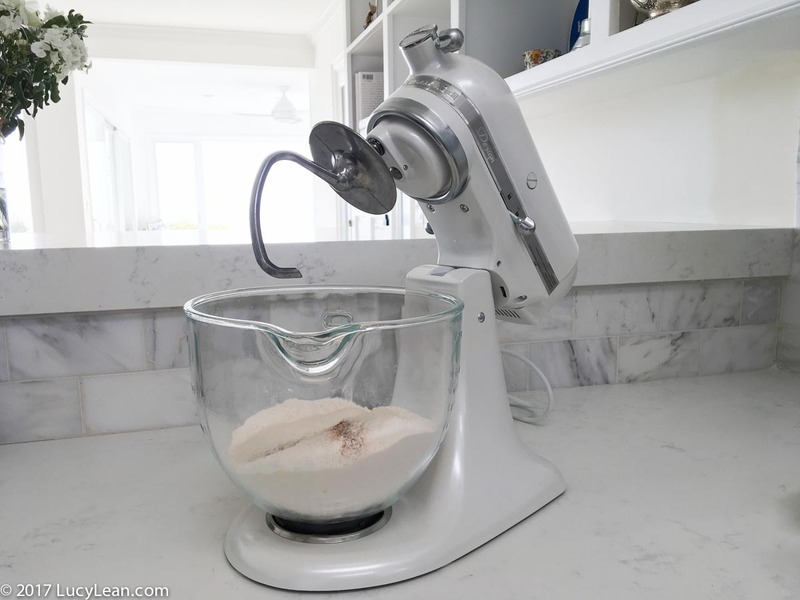 In the bowl of the Kitchenaid electric mixer mix the flour, salt, sugar and spices. Add the butter and rub in with your fingertips. Stir in the yeast and dried fruit and mix to combine. 3. Place the milk and the water in a jug and heat to 95-100 F.
4. Fit the bowl of the electric mixer in place and using the dough hook stir in the warm milk/water to make a sticky dough. Continue to knead on medium speed for about 3-5 minutes until the dough becomes smooth and no dough remains stuck to the sides of the bowl. You will hear the dough come together and lose the sticky consistency as the gluten is released. 5. Divide the ball of dough into 4 equal pieces. 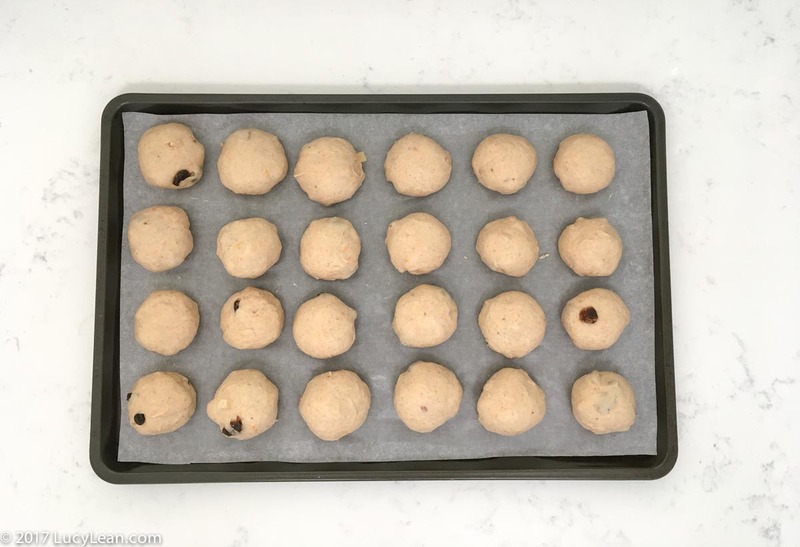 Then divide these quarters into 6 equal little balls, laying them out in 4 rows of 6 with a little space between on the lined sheet pan. Go back over each ball and work each of the 24 pieces, pulling the sides down and tucking them under to form a neat ball. Cover with the buttered plastic wrap and leave to rise for 1 1/2 hours. The buns will double in size and rise into each other. 6. After the buns have risen for 1 1/2 hours pre-heat the oven to 400 F.
7. In a small bowl mix together the flour and water for the topping to make a smooth paste. Spoon into a small plastic sandwich bag and snip off the corner to make a small hole. Pipe across the top of the buns to form crosses. 8. Bake for 15 minutes or until golden brown. The buns should sound hollow when tapped. 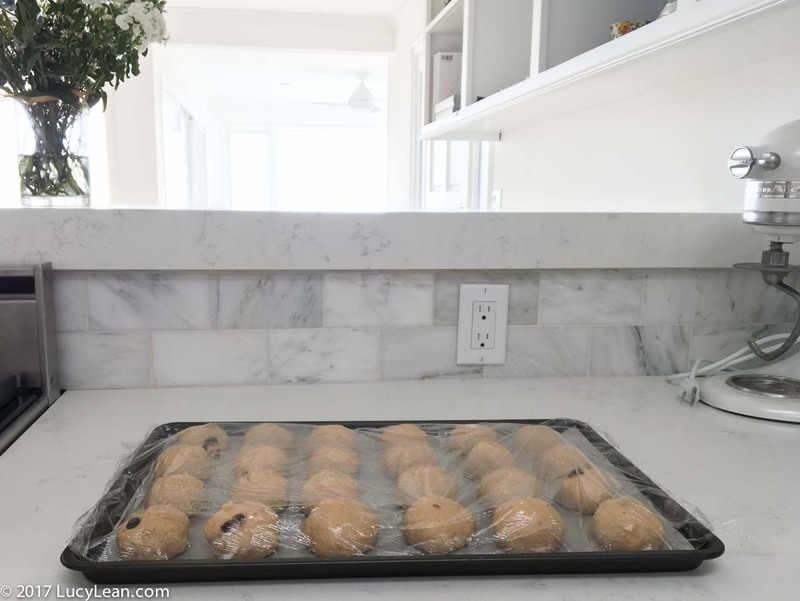 Transfer the buns in the parchment paper to a wire rack and let cool. The buns can be frozen at this point. To serve, heat the syrup and brush over the top of the buns. Place in the middle of the table and let people break off the buns, split and add butter. Now I’m off to blow 70 Quails eggs to fill them ready for Sunday and the visit from the Easter Bunny! Happy Easter everyone. Mix all the spices together, and store in a sealed jar away from light. 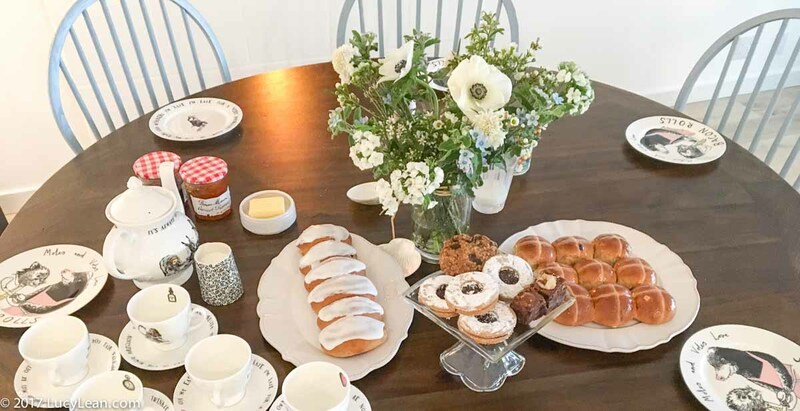 What a great idea for Easter Sunday brunch! When are you bringing my batch over? Can’t wait! They look delicious! I thought you were making your own?! They look so good – I wish I had seen this before visiting Grannie Val today with an offering of fresh, soggy Asda efforts – Sorry Grannie! 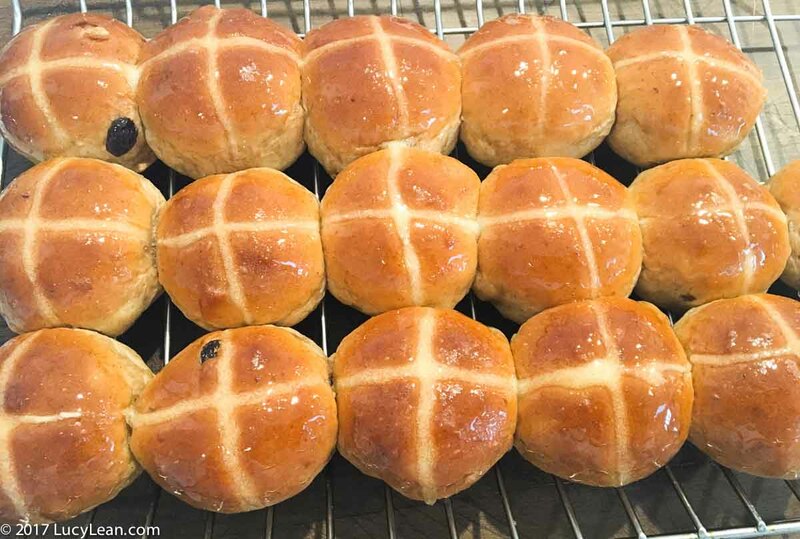 Hot Cross Buns seem so complicated, but as you describe the recipe to be so easy, I shall make them on Sunday morning in my nightie and fluffy slippers, while reading the paper… Stand by! Isn’t hot cross buns a song? They look amazing, as always. Bring your wares to nyc please. Yes it’s a song! And a spicy bun – would make you special without fruit!!! Brings back sweet memories of after school treats in England. Waaaaay better than peeps! Best use for Peeps – decorate an Easter bonnet! getting onto this, pronto!! happy good friday!